Where did that come from? I can understand the likes of Rush Limbaugh frothing at the mouth over Bane sounding like Bain Capital and calling it anti Mitt Romney. Tea Party conservatives are known to go loco over innocuous things. You can forgive them a little over disliking Batman because the movie does show some socialist themes which the Tea Party staunchly opposes. But why the heck is a liberal complaining that Batman is against the 99%? 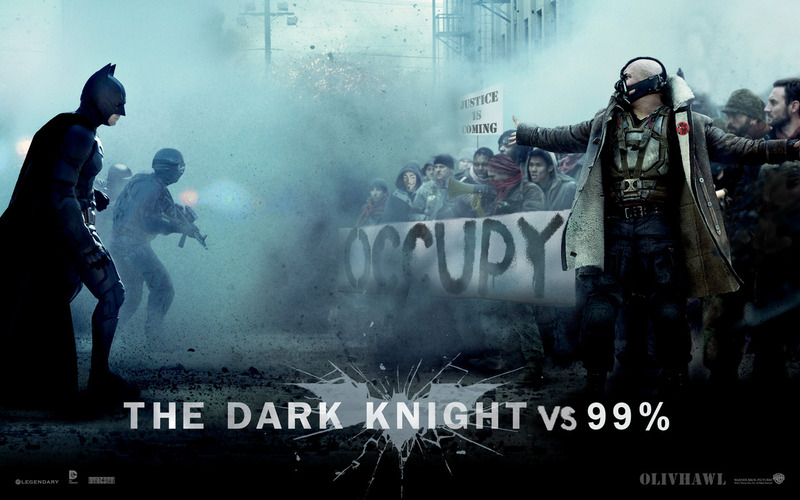 I don't understand how anyone can perceive the movie to be criticizing the Occupy Wall Street movement. 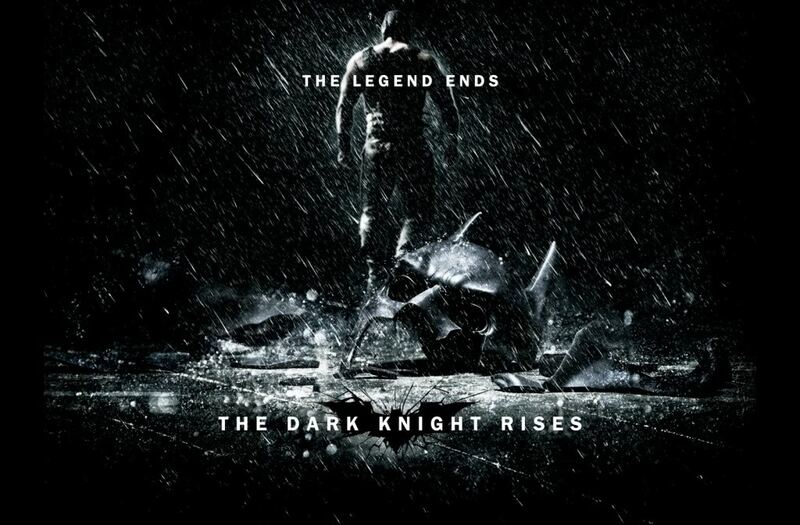 Bane is a hardened and violent criminal who will stop at nothing to fulfill his objectives. The Occupy Wall Street movement is a peaceful movement. You will not see Occupy Wall Street protesters gunning down people, taking banks hostages or trying to blow up entire cities. David Sirota of Salon.com needs to watch the movie more closely. Or perhaps he is not into literature. Many literature geeks have caught on that the Dark Knight Rises is heavily inspired by Charles Dickens famed novel 'A Tale of Two Cities'. Even those who have not read the book may have read several articles and fan logs online cataloging the similarities. Actually both liberals and conservatives who draw black and white conclusions from the movie should attempt to understand Dickens better. As a child Dickens was forced to work in a factory. During that time he faced the oppression and abuse faced by the working class of the industrial age. That is why he has always been sympathetic to the oppressed poor. His books offer a glimpse into the life and struggles of the proletariat during the industrial era. Oliver Twist, Nicholas Nickleby and David Copperfield keep finding the odds stacked against them and have to struggle to get their due in life. Bleak House, Tale of Two Cities, Hard Times all draw a sharp contrast between the lives of the privileged and the struggling working class. And who can forget dear old Ebenezeer Scrooge the bitter stingy miser whose spooky visits on Christmas eve transform him to a joyful charitable man? But while Dickens had a lot of empathy for the underprivileged, there were limitations to how far he went in terms of social justice. While Dickens would have strongly advocated socialist concepts like welfare, equal opportunity, minimum and fair wage, labor rights, 8 hour workday, health benefits and a lot more he never supported laziness or entitlement. Oliver, Nicholas and David never expected to be handed anything on a platter. The biographical David Copperfield is a cheerful, optimistic, extremely hardworking youth who truly believes in working his way to success. Pip of Great Expectations illustrates the follies of easy wealth and lack of gratitude. Pip gets an unexpected inheritance and is suddenly catapulted into wealthy society, a society he has desperately dreamed off. But he ends up losing everything to gambling, alienates his loved ones, has his heart mangled and broken until he finally understands the importance of family and being grounded. A balance of the struggles of the labor and the danger of going to far is represented "A Tale of Two Cities". Marquis Evrémonde is a vile and loathsome character. He is a wealthy aristocrat who has no regard for human life. In one event he runs over a child with his carriage and leaves him for dead. On the other hand Charles Darnay his nephew is a man born into aristocracy who loathes the class distinction. He cannot bear the atrocities committed by the rich against the poor. 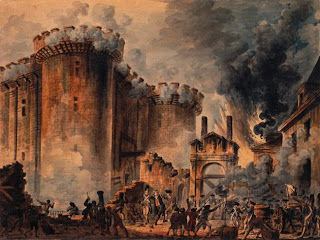 Madame Defarge is a cruel revolutionary. Coming from the oppressed class, she blindly hates all aristocrats and will punish Charles for crimes his relatives committed. On the other hand Miss Pross is a fiercely loyal servant. She has a sense of right and wrong and stands by her employer's family who has been kind to her. 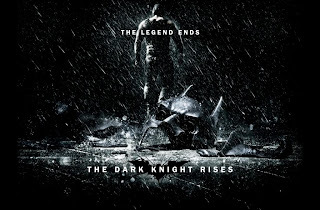 Gotham's reckoning in the The Dark Knight Rises is reminiscent of Dickens themes and motifs, and draws inspiration from a Tale of Two Cities. Gotham is one of those cities where the gap between the rich and poor has grown wide to the point of social instability. The rich live their comfortable lives, intentionally turning a blind eye to the growing squalor that surround them. Their only purposes is to make their lives even richer. The struggling poor have turned to crime and menace. There is no sense of morality and the poor rob and murder to sustain themselves. Bane is like a Madame Defarge who incites the citizens of Gotham on a violent revolution to reclaim their city. However, characters like Batman, John Blake, Commissioner Gordon and even Selina Kyle from all economic backgrounds and history come together to do the right thing. Like Dickens, The Dark Knight insists on maintaining a balance. There are indeed socialist themes in the movie. 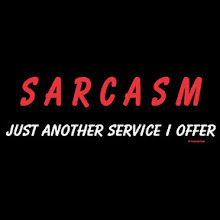 There is a sense of sympathy for the criminals. Their choices are not always of malice but desperation due to lack of opportunities as shown by children who enter the sewers so they can survive. The rich are also expected to owe something back to their city. The Wayne family and the Wayne foundation is engaged in a lot of social charities. Bruce Wayne's father tells him that they owe the people. Batman's struggles are because Bruce Wayne believes he owes Gotham. But that does not mean that the movie supports entitlement and giving free money to the undeserving as conservatives fear. John Blake personifies the ideal of how one should be. A poor orphan, but instead of turning to crime, he worked his way up to success honestly. A success story of rightly invested charity. Commissioner Gordon and all the good guys represent an upright middle class who don't want entitlement and charity, but fairness and no corruption. Most importantly Batman stands against villains - those who oppress the poor, and those who terrorize the rich. "Henceforth I declare you to be an outlaw"
With every discussion of Batman comes Robin, but this time it is not just Robin, but Robin Hood. Selina Kyle or the Catwoman who steals from the rich, reminded me of this very famous folk hero who is often misused by both sides of the social justice argument. It is often quoted that Robin Hood "Steals from the rich, and gives to the poor". As a legendary folk hero, it is natural that people look up to Robin Hood as a hero. And indeed Robin Hood is a great hero and role model for many. The tales of Robin Hood have not become popular and passed down for generations without good reason. However, it is irking when liberals take the hero worship to the extreme and believe that there is heroism in "stealing from the rich" in order to "give to the poor". Equally irking is when conservatives deem Robin Hood as a thief and a criminal due to his "stealing" and "giving", equating redistribution of wealth as theft and a crime. 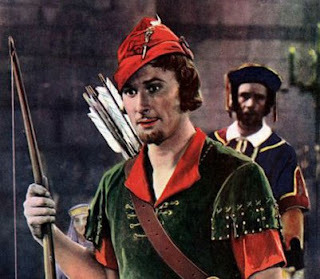 To say Robin Hood steals from the rich and gives to the poor is a gross oversimplification. It completely ignores the history, politics and economics times of England during Robin Hood's heyday. Not to mention that it completely fails to consider the background story and reason why Robin Hood a nobleman chose to become an outlaw. Robin Hood's roots are in feudal England. Peasants and farmers had no freedom back then. They owed allegiance and loyalty to feudal lords. The intent was that these feudal lords would govern the locality and care for their peasants. Unfortunately, the end result was abuse of power and neglect. Farmers and peasants who toiled day and night in the field to grow food crops often had nothing for themselves to eat. Feudal lords levied heavy burdensome taxes even in times of drought and crop failure, putting peasants in perpetual debt. Many feudal lords even claimed ownership of all produce and gave farmers barely anything for their hard work. These feudal Lords did not merely steal from the poor, they were kicking them to the ground, robbing them of everything they had including their dignity and leaving them penniless and desperate. It is in this feudal system that Robin Hood stands against. When he returns from the crusades he is disgusted by the England under King John. In his hometown of Nottingham he is appalled to see the sheriff unleash such cruelty on his people. As a well placed man in society Robin Hood could have easily been apathetic to the situation. However, he chooses to protest. Initially he demands fairness. That taxes be levied fairly and the farmers be granted relief in extreme circumstances. That farmers and peasants be allowed to sell their for a fair price and make a reasonable living for their hard work. Only when he was declared an Outlaw and robber of his land, for trying to do the right things did Robin Hood become the "Prince of Thieves". There was no alternative. The noble class was robbing the people blind and this was the only way to ensure a fair economy. Outside the legends, it is people like Robin Hood who got KingJohn to sign the Magna Carta. If you have studied political science or political history, Magna Carta is the mother of all charters. It is the grand daddy of modern democracy. The Greek gave us the idea of democracy, but democracy as we know it today was because of the Magna Carta. This document was the catalyst that spurred changes that led to modern democracy. 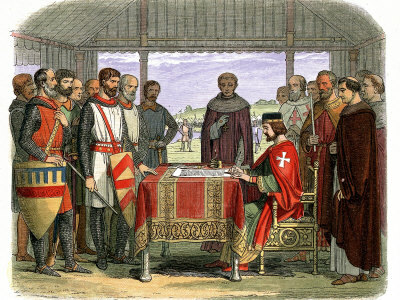 Many Barons who were tired of the king's weak rule, upset at the arbitrary laws and punishment and sick of the overall squalor and poverty of the countryside rebelled against King John and made him sign the Magna Carta. The Magna Carta laid the foundation of free people, and protected them from arbitrary punishments without due process. They diminished the power of the king and let a majority of barons overturn his decisions. Tea Party members who scream "don't tread on me" would behoove to know that the concept of fredoom from dictatorial leadership was because of men like Robin Hood. Had it not been for these men tired of unfair monarchies and dysfunctional feudal systems, modern agriculture and free trade as we know it would not have been evolved. So before we paint Robin Hood as just a "thief" we should take pause and think of what he stood for. Even though the feudal system was ages ago, the industrial age ushered in a new era of struggle between the elite and proletariat. People worked in factories for 12-16 hours a day, seven days a week for meager wages. Lunch breaks were often a hurried 10 minute affair. The worker had no family life or freedom. Many faced dangerous and deadly jobs without fair compensation. Children as young as five were working in factories and mines. Mortality rate was high. They had absolutely no opportunity to rise in society. Many fortunes came on the backs of these laborers who were robbed of their fair share of economic benefits and boom of the revolution. The purpose of social justice is not to "steal" from rich, but ensure that everyone gets the fair share of their hard work, that the labor class is not exploited. Redistribution of wealth is not for the sake of redistributing and punishing the rich, but giving everyone the opportunity they did not get for generations. People should understand the basic principles before thinking it is just a ploy to "steal from rich" and "give to the poor". And those who hail Robin Hood as the "Prince of Thieves" and want to steal from the rich should know that theft is a crime. The purpose is not to take away from the rich, especially not for those who work their way up. The purpose is to establish an economy where everyone has fair and equal opportunity. By glorifying "stealing from the rich" and "giving to the poor" without history, reason or perspective is counterproductive to the intent. We need everyone to embrace Robin Hood as their hero, a champion for democracy, for people, and a fair free market that we claim to be proud of - not as just a thief.